Mayor de Blasio is making yet another bold proposal, this time calling for mandatory paid time off for workers, as he noted that a half-million New Yorkers don't get paid vacation days. Some small businesses are wary. Roseanne Colleti reports. 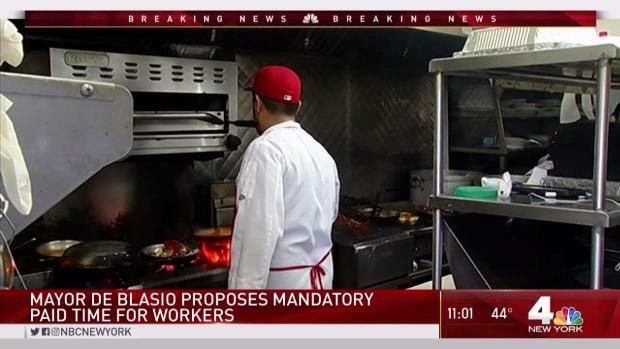 Mayor Bill de Blasio made a bold proposal Wednesday — he wants New York City to be the first in the nation to mandate personal time for workers. The proposal is ground breaking for New Yorkers as no other city in the country requires private employers to pay workers for time off for vacation. 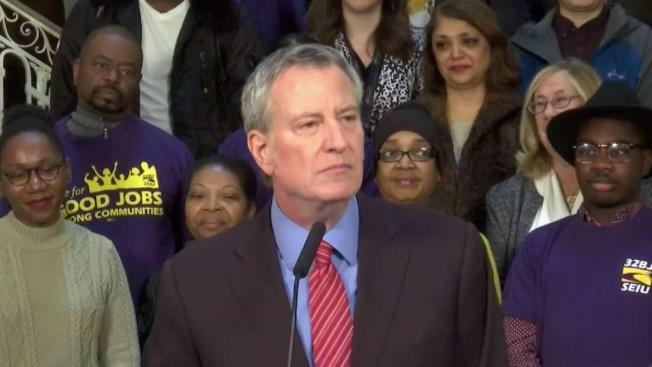 "New Yorkers need a break," the mayor said said during his announcement from City Hall, where he was accompanied by workers. "If you work hard and you don't get a break, that's not fair." De Blasio's proposal, if passed by the city council, would impact more than half a million workers who are without any paid time off, including 180,000 workers in professional services, 90,000 in retail, and 200,000 in the hotel and food service sectors. "That’s wonderful I’ll have to talk with my boss about that," Rina Spielberg, who is a part-time worker, said. The proposal is already experiencing push-back with some saying it will hurt businesses and result in lower salaries. However, the mayor said that argument was used each time the city raised the minimum wage and yet the city has more jobs than ever before. Mayor Bill de Blasio made a bold proposal Wednesday as he seeks for New York City to be the first city in the nation to mandate personal time off for workers. Melissa Russo with the story. If the bill is passed it will require private employers with five or more full- or part-time employees to provide 10 days per year of personal time off for any reason, like vacation, religious observance, bereavement or family time. Eligibility for the time off would start after 120 days on the job employee would accrue on hour paid leave for every 30 worked for up to 10 paid days a year. "Every other major nation recognizes the necessity of Paid Personal Time. We as a country must get there, and New York City will lead the way," de Blasio said of the proposal. Research has shown that paid-time off helps increase productivity, strengthens families, helps prevent burnout and improves employee retention, he mayor's office says, adding: "The United States is the only industrialized nation that does not mandate any paid time off, including paid holidays. Nationally, one in four full-time, middle-income workers gets no paid time off at all." The mayor hopes the city council will pass the proposed measure within a few months. The announcement is part of a days-long rollout of progressive policies in anticipation of his State of the City speech, which is scheduled for Thursday. On Tuesday, de Blasio promised comprehensive health insurance for uncovered New Yorkers. The mayor has been pushing the theme of making the city the fairest in the country. 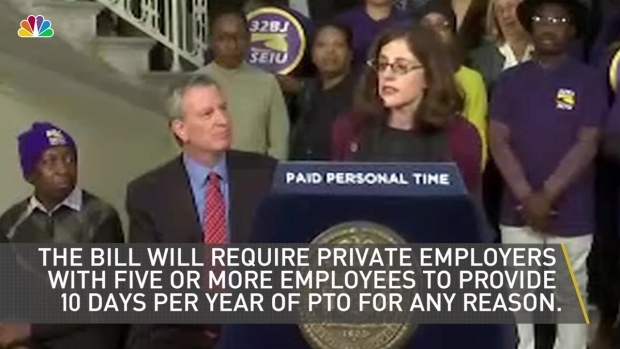 During his first term, de Blasio enacted mandatory sick leave pay for private businesses. Wednesday's new proposal will build on those benefits.